"The bit I'm really looking forward in Marvel Comic's adaptation of The Last Jedi is the Canto Bight sequence". Said no-one. Ever. 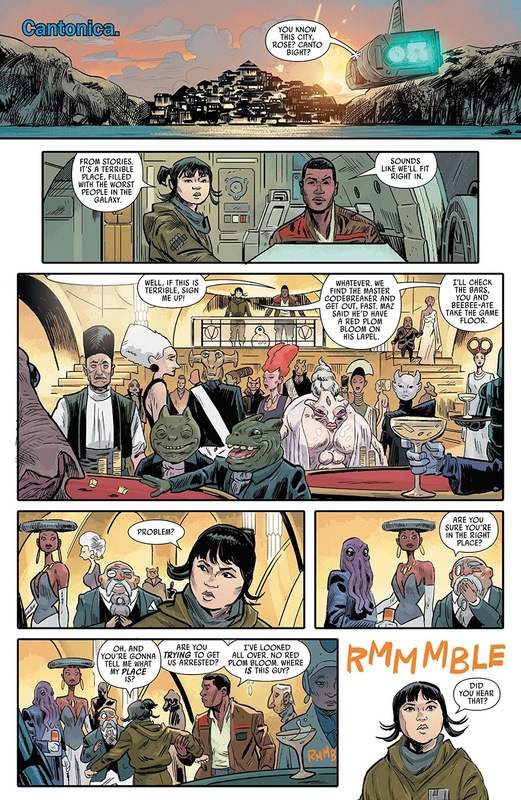 Yet, here I am, humble Star Wars reviewer for award-winning website Weird Science DC, reading and reviewing the Canto Bight sequence for your pleasure. It sure as hell wasn't my pleasure. Where to start? Well, unfortunately, it has to be the art. There are two aspects to comment on here. Firstly, it really is awful. Well and truly awful, I honestly wish it wasn't. It is however so bad that I actually burst out laughing at one point. 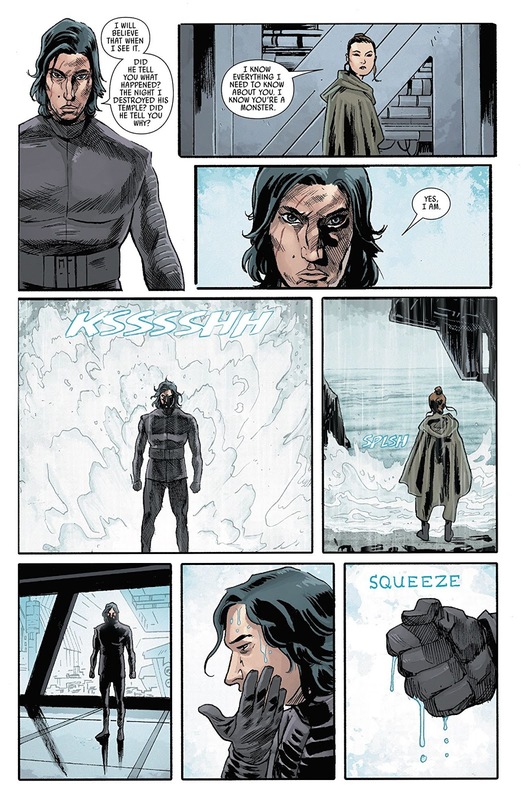 I mean when Admiral Holdo pops up I burst out laughing and spat my coffee out. She isn't featured in the preview art in this review but I swear, go into your comic shop and have a look. Its like a little purple haired version of Tim Burton's Queen of Hearts (Helena Bonham Cater) from the Alice in Wonderland movies. Secondly, and this is a more serious point, the art just doesn't work in order to convey the intricacies of some of the "set pieces" in the film. Take the Rey-Kylo Skype sessions for example - they don't work in this book as it just appears as though the two characters are in the same location. I mean it doesn't work in the movie either but that's because it's dumb, not because you can't tell what's going on. 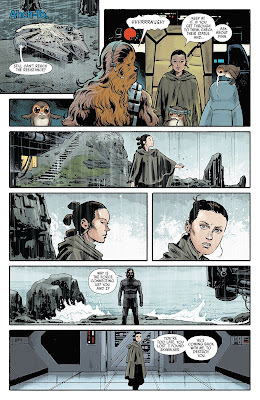 Likewise the Rey in the mirror scene, pretty visually appealing in the film (one of the moments I liked) doesn't have any magical quality here at all, the scene doesn't work in this art style (and maybe even the comic book medium). 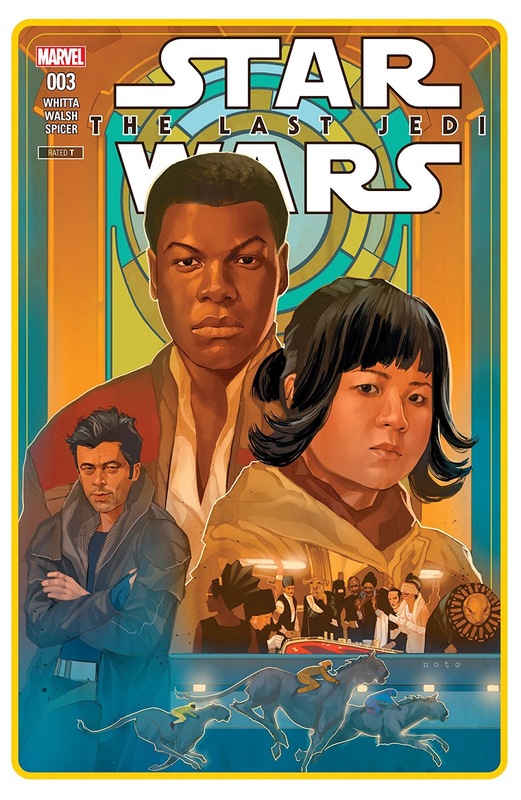 The writing is awful, but then you can't blame Gary Whitta totally, he was on a hiding to nothing with this issue. Firstly, this is the bit of the plot where the slowest chase scene in movie history is dragged out in the most expensive way ever seen on the silver screen. Secondly, this is the bit where we get the most useless bit of the film Canto (who cares) Bight. So really what could Gary do? 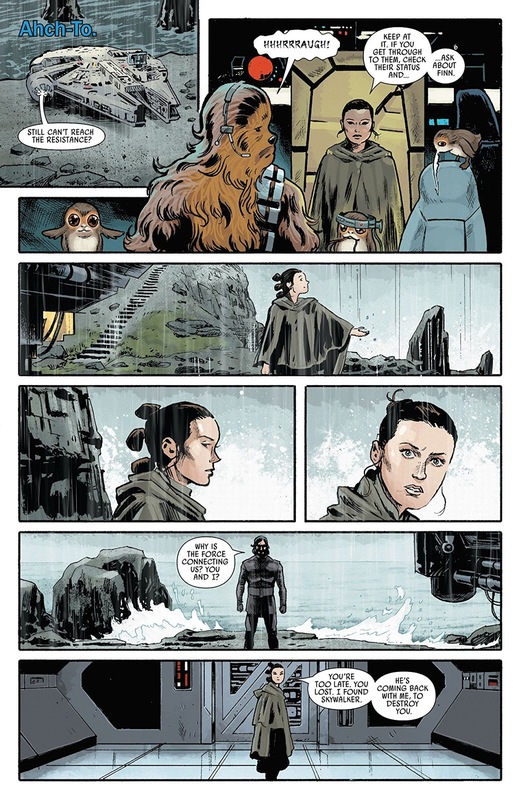 Even at that, his work is so dull, that he only gives us one bit of interesting text and that is a bit of internal monologue that Luke has while watching Rey train. That was all that I found of merit. I can't find myself giving any marks for the art as I think I could have had a better go at this book. I always have my suspicions that Marvel Star Wars editorial rush the artwork on these books so this may be harsh, but it is true. To my mind, this book gets one mark for the internal monologue and one mark for the Noto cover, which only goes to prove the old adage about books and covers. Once again, thanks for the warning on this. With the rising cost of comics, I REALLY appreciate the honest reviews from this site!